From 7-30 September: Design September program. Celebrating 10 years of his studio and artistic practice, Chronosophia is the first solo exhibition by Tomáš Libertíny showcasing a selection of his new and recent works—interactions with nature that explore the notions of time and repetition. Born in Slovakia in 1979, Libertíny studied at the Technical University Košice in Slovakia, focusing on engineering and design. He was awarded a scholarship from George Soros’s Open Society Foundations to study at the University of Washington in Seattle, where he explored painting and sculpture. He continued his study at the Academy of Fine Arts and Design in Bratislava in painting and conceptual design. After receiving the prestigious Huygens Scholarship, he enrolled in the master’s program at the Design Academy Eindhoven, where he received his MFA in 2006. In 2007, the artist founded his Studio Libertiny in Rotterdam, where he explores the relationship between nature and technology through conceptual and physical research into the design and construction of sculptural objects and installations. With a strong background in classical and literary culture, Libertíny pursues a visionary exploration of both the physical and the philosophical, seeking constant innovation in production methods and harmoniously combining the technical know-how of industrial design with the poetry of art. Libertíny’s artistic quest is at the very heart of the solo show hosted at Spazio Nobile. Entitled Chronosophia (“The Wisdom of Time”), it features, for the first time in Belgium, a selection of his new and recent artwork that highlight, with a great variety of media and expressions, the intriguing interactions between nature and culture and challenge the notions of time and repetition. 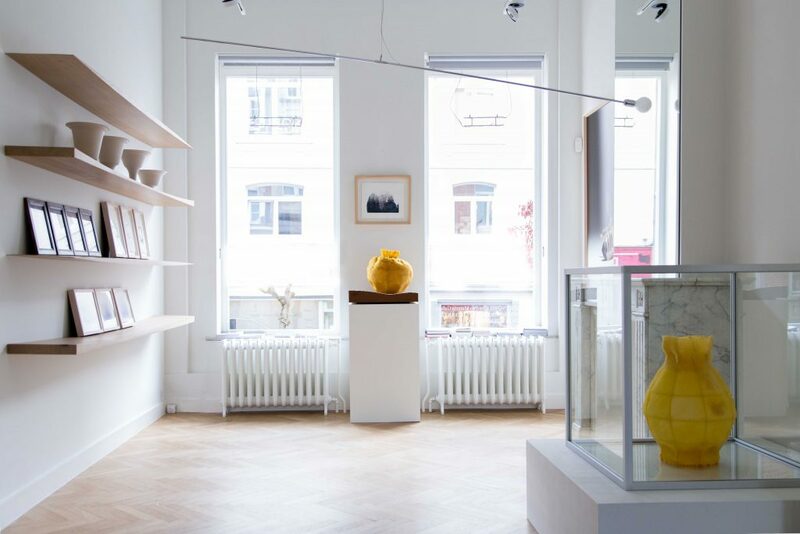 His world-acclaimed beeswax artifacts such as the Honeycomb Vase and The Vessel #1 result from the Made by Bees project, where real bees are involved in manufacturing, following a sort of natural “slow prototyping” process. Beeswax is also a component of the impressive Weldgrown wall installations, where the vortex made of continuous hand-welded stainless steel wire suggests ideas of circularity and inherent infinity. With the BiC ink series, represented by the Bluescapes, the Blue Diptych and various works on paper, the artist plays with presence and absence through the bold yet subtle materials and the alternation between filled and empty spaces. The exhibition is completed by various other graphic works and art objects, illustrating the extent of Libertíny’s research into forms and materials. From his Paper Vases, sublimating the contrast between their apparent physical ephemerality and the classic timelessness of their design, to the organic deployment of the Bleeding Drips series, Libertíny’s Chronosophia reveals a creative universe constantly boiling with surprising fulgencies and dialectical tension between the search for perfection and truth and a form of personal catharsis. Tomáš Libertíny has participated in many individual and group exhibitions held in institutions and venues such as the Venice Art Biennale, the Victoria & Albert Museum, the Museum of Art and Design New York, the Holon Design Museum, Bozar Brussels, Espace Fondation EDF, the Beirut Exhibition Center, MARTa Herford, MAC’s Grand-Hornu and more. His work is also displayed in several prestigious permanent collections, including MoMA in New York, Museum Boijmans Van Beuningen, the Cincinnati Art Museum, MUDAC, the Museum of Design and Contemporary Applied Arts in Lausanne, the Corning Museum of Glass and CIC Rotterdam.